Accessories is the term used to represent a wide variety of aids and tools for handling, inspecting and storing philatelic and other items. 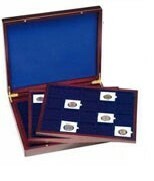 Examples of these are tweezers, magnifying glasses, stamp albums, special UV lights for watermark detection, coin holders, coin and banknote albums, etc. Unit 3 37/39 Green St.